9News VP for News and Current Affairs Pal Marquez sent a short statement shortly after we published this story, saying: "Claire made her decision and we thank her for her contributions to the network's growth." 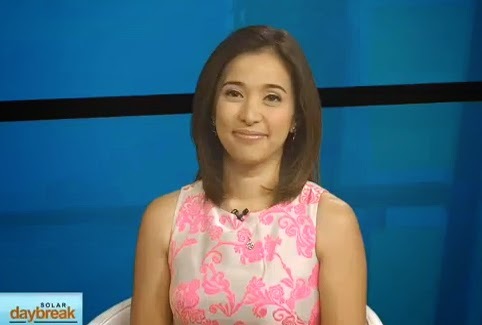 Claire Celdran, co-anchor of Daybreak, has resigned from the 9TV morning show. 9TV has yet to issue an official statement about her departure, but multiple sources have confirmed the news to Media Newser Philippines. Celdran, considered to be one of the original Solar News pillars, was last seen on the show during its September 22nd broadcast. Celdran had been with the network since its launch back when it was still known as TalkTV. Before that, she had spent a decade harnessing her skill as a journalist in the U.S., where she became a news anchor for the New Jersey-based television station EbruTV. We've reached out to both 9TV and Ms. Celdran for comment. We'll let you know once we get a response from them. @hilaryisaac but where is ms @ClaireCeldran why is she not around?? still no @ClaireCeldran on #Daybreak 😞 ,you are breaking my husband's heart 💔💔. Mornings on @9tvph are not the same w/o you. I hope when I wake up tomorrow and turn my tv on, it's your face I get to see, ultimate dream girl @ClaireCeldran. Sobrang nakakamiss ka na. @ClaireCeldran hi ma'am Claire....hw r u?have great wkend ahead...hop to see u on daybreak next week.